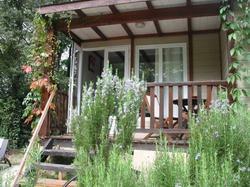 Sitting in a 5-hectare park, Gîtes La Terre des Lauriers is located in Remoulins, 800 metres from the Pont du Gard. You can enjoy the private beach, set on the banks of Gardon River and the heated, outdoor swimming pool. Gîtes La Terre des Lauriers provides self-catering cottages, all with a private entrance and a wooden floor. They all feature a furnished terrace, a TV and a shower. Free toiletries and ironing facilities are also available to guests. You can prepare meals using the cottage?s kitchen, which is equipped with ceramic hotplates, an oven and a fridge. An electric kettle, a dining area and a coffee machine are also provided. There is a bar on site and a restaurant can be found 200 metres away. With an extra cost, you can access the spa and the property is equipped with free Wi-Fi. Free private parking is also possible on site and both Nîmes and Avignon are 18 km away. Please note that the 30% prepayment by cash, cheque or bank transfer is due before arrival. The property will contact you directly to organise this. Offering a terrace and views of the olive trees, this air-conditioned bungalow features: - 2 bedrooms - A living area - A TV - A shower - Access to the park and the swimming pool. Offering a terrace with direct access to the park and the swimming pool, this cottage features: - 2 bedrooms - A living area with an equipped kitchenette - A private bathroom with a shower.